Test results from The Hypervisor Lab show the new MacBook Pro, launched last week, is almost twice as fast running common video processing software than it predecessor. In our tests we converted a normal MPEG2 video stream from DVD format to H.264 MP4 using a MacBook Pro fitted with a 2.4GHz Intel Core Duo – Apple calls this a model 7.1. 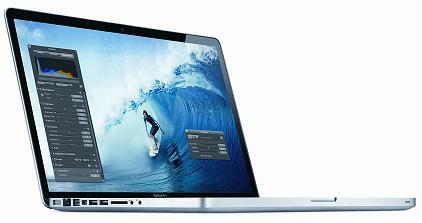 We compared the results to the brand new MacBook Pro fitted with a 2.3GHz Intel Core i5 – Apple calls this a model 8.1. We used the popular HandBrake video conversion software to test the performance of both laptops. The older MacBook Pro took 1h 35mins 18secs to transcode the video stream, while the new MacBook Pro did the same work in 52mins 5secs, around 45% faster. During our tests the CPUs in each MacBook Pro were running at 100% utilisation, indicating that the transcoding was being done by the main CPU rather than being offloaded to the graphics processors fitted to each laptop. CPU utilisation during playback of the MP4 file was 8% on the new laptop and 26% on the old one. It was also interesting to note that both laptops took exactly the same time to copy the movie data from DVD disk to each laptop’s hard disk. Related Article: MacBook Pro Browser performance results. This article was published on Tuesday, March 1st, 2011 at 4:53 pm. You can follow any responses to this article through the RSS 2.0 feed.